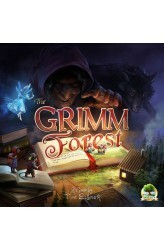 Welcome to The Grimm Forest, where family members of the legendary Three Little Pigs are having an epic house building competition. But this is no ordinary competition as all the most famous Fairy Tale characters will be looking on and occasionally lending a hand. Who will benefit most from the cunning of Robin Hood, the beauty of Snow White, the bountiful gifts of the Golden Goose or the dark witchcraft of the Evil Queen? Using only their wits, a handful of sharp steel tools, and a few stacks of resources gathered at great risk from fields, brickyards, and even the dark and deadly Grimm Forest itself, each player must compete to be the first to build 3 Houses and gain the title of Royal Builder. Players are encouraged to use any of the devious tricks they have read about in..